If you arenâ€™t already well versed in kung fu movies, it can be pretty hard to get into them.Â What exactly is it that you are supposed to appreciating?Â Is it the fighting or is it the choreography?Â Is it the symbolism or the acting?Â Is it the story or the meta-context of the movie?Â Most people end up just liking it because people get beat up and there are some sweet explosions.Â Now the movie that has all of the above is ready for you to bring home in a brand new format today! 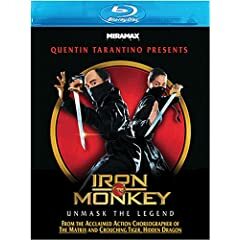 Starting this September 15th, now available on Blu-ray Disc from Miramax Films comes a groundbreaking and breathtaking martial arts film presented by a true master of the cinema.Â Iron Monkey â€“ Blu-ray Disc is ready to come scrambling out of your television screen and fill your living room with high-flying martial arts displays and compelling adventures.Â Bring home this movie in high definition today! China is a deadly and tragically unjust place in this movie.Â Evil is rampant and the terribly corrupt government leaves a reign of terror and oppression across the land.Â Only one man is brave enough to stand up to them, venturing out at night to wreak havoc with his kung fu ways.Â No one knows who he is and he is known only as the Iron Monkey.Â When his actions against the government begin to step up, what will possibly come of him and his kung fu activism? The special features included in this Blu-ray Disc are a very informative interview with Donnie Yen and a really awesome interview with Quentin Tarantino. This movie is beyond fantastic!Â The number one clue for that is that none other than the genius of film Quentin Tarantino presents this movie.Â In my opinion, this just might be the greatest kung fu movie of all time.Â Those fights are just amazing!Â This is one movie where the story works perfectly with all of the fights and all of the wire fu.Â Even the whole lone hero fighting against the horrible corrupt government storyline doesnâ€™t get that old because this movie is nearly perfection.Â This is a movie that everyone should get out and see and then you will learn exactly what it is that kung fu movies are supposed to be like. Youâ€™d have to be made of Iron to not love this film. This Blu-ray Disc is available at Amazon.com. No user commented in " Movie Review: Iron Monkey â€“ Blu-ray Disc "